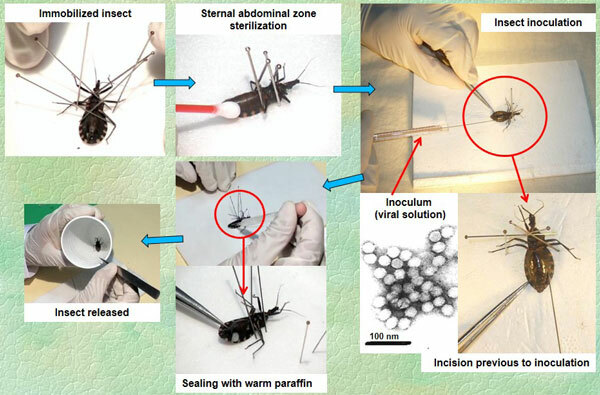 Vectors of Chagas disease are currently controlled by employing several chemical insecticides though there is a continuing search for alternative ecological methods against disease causing vectors. An effective method includes the use of specific pathogens as biological control agents. The aim of this work was to describe a complete experimental inoculation protocol in triatomines. The intrahaemocoelic inoculation technique can be applied to inoculate different kinds of microorganisms such as viruses, fungi, bacteria and protozoa; so it could be considered a useful tool in infective bioassays. This article includes results from evaluations of Triatoma virus (TrV, Dicistroviridae: Cripavirus) infectivity in several triatomine species. The protocol, also suitable for any other kind of insects, describes the materials and steps required to safely inoculate the insects, preventing any damage and/or contamination.